High levels of toxic heavy metals are present in samples taken from the Kingston Fossil Plant ash spill in Harriman, TN, independent testing shows. Preliminary testing was conducted on samples from the Emory River by scientists working in coordination with Appalachian Voices and the Waterkeeper Alliance’s Upper Watauga Riverkeeper Program. Concentrations of eight toxic chemicals range from twice to 300 times higher than drinking water limits, according to scientists with Appalachian State University who conducted the tests. The tests were conducted this week at the Environmental Toxicology and Chemistry labs at Appalachian State University in Boone, NC, by Dr. Shea Tuberty, Associate Professor of Biology, and Dr. Carol Babyak, Assistant Professor of Chemistry. Donna Lisenby from three separate locations on the Emory River. four times the allowable amounts. waste spill, in front of the Kingston Fossil plant intake canal just downstream from the spill site, and at a power line crossing two miles downstream from the spill. “I have never seen levels of arsenic, lead and copper this high in natural waters,” said Babyak. Recreation on Watts Bar Lake and nearby regions downstream from the site could be affected for some time to come, Tuberty said. Some heavy metals can accumulate in fish, making them unsafe for eating. Although simply touching the water will not necessarily be dangerous for people, failure to wash after contact or swallowing water while swimming could also pose risks. According to Dr. Tuberty, while the toxicity levels of heavy metals in the water are cause for concern to humans, there is even more cause for concern regarding aquatic life’s ability to survive and reproduce in waters with these levels. Of particular concern are metals such as selenium and mercury, which bioaccumulate, or increase in concentrations in tissues of animals higher on the food chain. Birds and mammals that ingest fish and invertebrates contaminated with these metals are at risk of health issues. 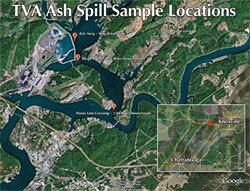 The TVA has not released any water quality or solid soil sample results from the immediate spill site. The only results the utility has released to the public to date were from the Kingston water facility intake 6 miles down river from the spill site, and approximately half a mile upstream on the Tennessee River. According to Tuberty, with a sediment spill, downriver contamination can take place over time rather than immediately following a spill. Dr. Babyak, an environmental chemist at Appalachian State University, obtained her doctorate at West Virginia University and specilized her study on coal plant emissions.